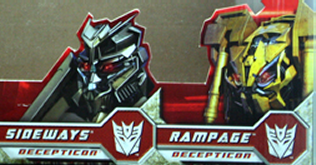 Revenge of the Fallen Autobot Strike Mission images! Our readers came up with these 3 great questions to send in on May 4th, and after a couple week’s extra delay (we’re assuming for Botcon), Hasbro was generous enough to supply us all 3 answers. Here’s my coverage of both Hasbro panels at Botcon 2009 in Pasadena. The Saturday panel was 2 hours with lots of Q&A, so it’s a very long write-up. But the Sunday panel was a mere 14 minutes long due to a special celebrity guest, and had no Q&A, so it’s extra short. Balances out, I guess.